What can the religious objects used by nineteenth- and twentieth-century Americans tell us about American Christianity? What is the relationship between the beliefs of the faithful and the landscapes they build? This lavishly illustrated book investigates the history and meaning of Christian material culture in America over the last 150 years. Drawing on a rich array of historical sources and on in-depth interviews with Protestants, Catholics, and Mormons, Colleen McDannell examines the relationship between religion and mass consumption. McDannell claims that previous studies of American Christianity have overemphasized the written, cognitive, and ethical dimensions of religion, presenting faith as a disembodied system of beliefs. She shifts attention from the church and the theological seminary to the workplace, home, cemetery, and Sunday school. Thus McDannell highlights a different Christianity – one in which average Christians experience the divine, the nature of death, the power of healing, and the meaning of community through interacting with a created world of devotional images, environments, and objects. 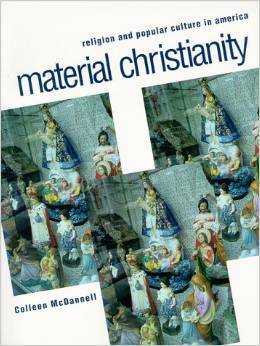 McDannell is concerned with physical and material expressions of religion often overlooked in discussion of American Christianity. She is critical of approaches to secularization and religion that shift attention from material dimensions of religion to “religious” dimensions of secular material culture. These approaches, which she associates with distrust of the material and the masses, are evident in Protestant emphasis on the written word at the expense of unwritten practice and in critical traditions associated with the Frankfurt school that understand mass culture as manipulation made possible by the “weak egos and submissive psyches” of the masses. The Frankfurt school’s Marxist roots incline toward appreciation of the material, but they are “protestant” enough to associate criticism with the words of a revolutionary elite that rises above the material practice of the masses. To her credit, McDannell is interested not in “rising above” that practice but in examining it as an expression of culture. She does this in a series of carefully documented and clearly written case studies ranging from Roman Catholic sacramentals through the rural cemetery movement to Mormon garments and Christian retailing. The careful intertwining of theory and practice in historically informed case studies is exemplary for readers with a specific interest in material Christianity as well as those with a more general interest in material culture and the making of meaning.